Roy Lichtenstein is regarded as a key member of the groundbreaking 1960s Pop Art movement, a group of artists that also included Andy Warhol, James Rosenquist, and Marisol. Many pop artists focused on popular culture and mass media, two subjects previously considered unworthy of fine art. As an artist who was clearly influenced by art history, Lichtenstein no doubt was affected by the seismic shift in the art world caused by Abstract Expressionism, the movement largely based in New York that defined the United States as a global leader in culture. At this time, Lichtenstein was studying fine art at the Ohio State University in Columbus, where he received his MFA degree. In 1951 he moved to Cleveland, where he stayed for several years. In Little Big Painting (1965), one of the most iconic works by the Pop Art master, Lichtenstein wryly takes on Abstract Expressionism, rendering the wild gestures of action painting in a hyper-mechanic style. For a painting that is seemingly composed of giant, confident brushstrokes, it is especially amusing that, when studying the work up close, there isn’t a brushstroke in sight. 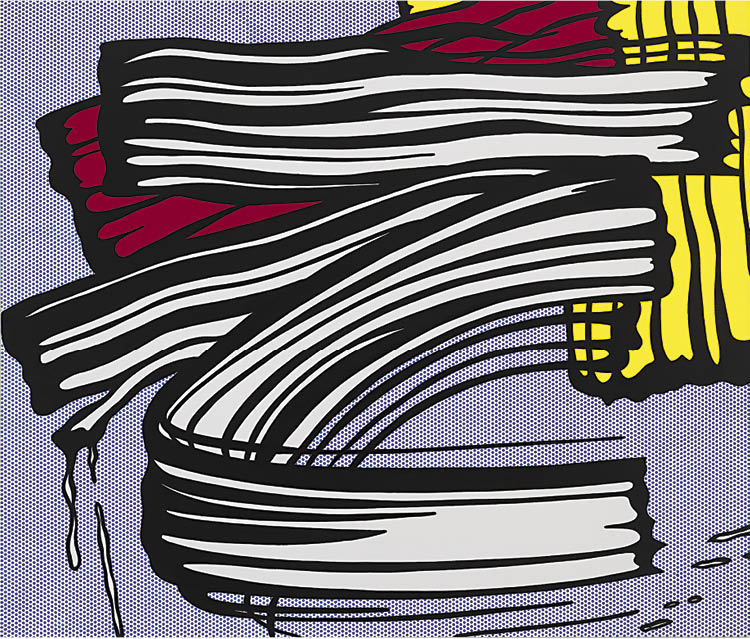 Lichtenstein uses his characteristic Benday dot technique—which originates from the halftone printing processes of newspapers and comic books—to poignantly send up this style of art that had felt confining to his generation of fellow artists. Mimicking Abstract Expressionism’s haphazard free spirit, Lichtenstein’s version appears mass produced, ready to be marketed and sold. By lampooning what was then considered the height of contemporary art in the visual language of “low culture”—advertising and comic books—Lichtenstein created a landmark icon of American culture.